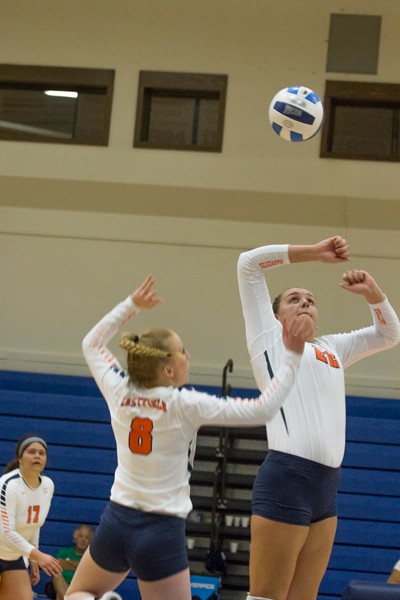 The Eastfield volleyball team is riding a nine-game win streak, including a perfect 5-0 run in conference play at the halfway point. The Harvesters have a second match against each conference team remaining. Eastfield has only dropped two sets, one to Brookhaven (4-1) and one to North Lake (2-3) and appears to be in the driver’s seat for the top seed in the Dallas Athletic Conference. The Harvesters are No. 4 in the country and, if they continue to have success, should stay within the top 10 of the national poll. The roster is loaded top to bottom with reliable contributors from star players like Keishla Reyes and Alex McPherson to reserves that have provided valuable sets like Skylar Fowler and Shelby Browning. Reyes, a sophomore outside hitter, is a two-time Metro Athletic Conference player of the week this year, while sophomore middle blocker Chloe Hope has also won the award this season. Reyes and sophomore libero Maura Munoz have both been named NJCAA Division III player of the week once this season. As the defending national champions, expectations for the team are high. However, Crisp doesn’t want the ladies looking too far ahead. “Coach preaches to us that we don’t need to talk about the championship and tournament as much because until we win these games we won’t be there,” Hope said. Hope thinks Eastfield has a target on its back. Eastfield was ranked No. 2 in the country last season before the national tournament and is currently No. 4. Crisp expects teams like Brookhaven and Cedar Valley, who could greatly benefit having a higher seed than Eastfield, to bring their game up a notch this second time around conference play.